The HUSS Ranger was first manufactured by HUSS in 1981, and is now in approx. 32 locations worldwide. 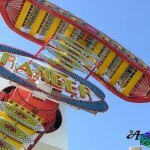 Some 3 years later, the Ranger design was modified to form Rainbow – each ride offering a completely different sensation. The Ranger looks impressive at night with a height of 66 ft and a dazzling light display. 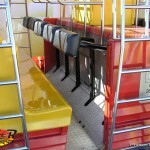 Though single-armed, it accommodates a huge capacity of 40 adult riders in 8 rows. 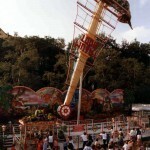 The operator has a choice of 4 ride programs or manual operation with a fast or slow orbit with varied heights. Unlike any other pendulum ride, the ship can orbit 360° from a stationary position due to its nearly 2-tonne counterweight. The Ranger has an innovative safety harness for the rider. Instead of over-the-shoulder restraints, it uses fully-automated rectangular pads which pushes against the riders stomachs. (see photo) First-time riders are always taken by surprise as the safety harness closes, giving them the feeling they are about to be completely crushed! Nevertheless it is quite comfortable and fairly unrestrictive to the rider’s upper body unlike most upside-down rides using an over-shoulder restraint. Like Rainbow, the arm is swung hydraulically with four 90Kw drives. theres lots of names for this too, there was one at M&D but it was removed, I wonder why? i went on it before, not as scary s you guys friken think. pretty safe too. Awsome!!!! Let me try it!!!!!!!! can anybody tell me where to hire one of these rides?????? 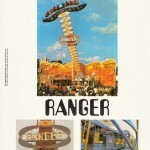 I went on a double Ranger. It was scary!! It would probobly feel like you;re fixin to fall out!!! Love the Ranger Ride. 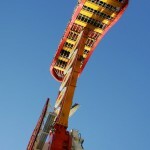 I was privileged enough to operate the one based at Luna Park (Sydney)for nearly three years 2004-2007. While she is a old girl she was a stunning machine to operate. Only issue is heat with her due to being built in Germany (Not as not in the northern hemisphere as here) but still you forgave her for that. Hundreds of thousands of people where turned into their heads by me and the Ranger and I must say although I don’t work at that establishment anymore it was The best job still to date that I ever-had. Who is the original version? 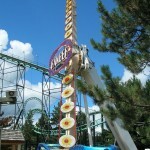 The former one at Adventureland Long Island was named Looping Star. Great ride. For a while there it was the biggest thrill in the park. Replaced with a Top Scan by Mondial, which someone fell out of, and so was replaced by a kids flume. Adventurland LI has a long relationship with HUSS. They had a Troika, Enterprise, UFO, and still have Pirate and Frisbee. HUSS made some good stuff. Deggeller has one of these as well for a few years. It was minue the back scenery, but a Huss model. He carried several Huss rides over the years (1001 Nights, Breakdance, Pirate, and Ranger). But due to fuel costs has sold all of them except the Pirate (not on the road). Great piece. there’s 1 of these at sydney luna park! We have 2, one older than the other; both are HUSS and still operating, the two are in different cities and both are called NAO de China, and are customized as Ship, great ride, love the sound. Someone essentially assist to make seriously articles I’d state. This is the very first time I frequented your web page and thus far? I surprised with the analysis you made to make this particular submit incredible. Great process! I have one huss ranger for sale! Would like to know if anyone is interested in this ride you can email me at cjmullen33@gmail.com !!!! Not alot of these left!